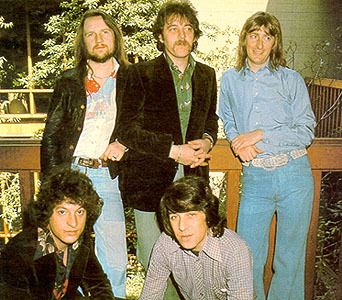 Played with Procol Harum at the tail end of the Something Magic tour: pictured here at Hofstra, 5 May 1977. Dee died in Nashville, Tennesee, at Vanderbilt University Hospital. Please mail us with further information. Jonathan Berle writes to BtP: the long-lost album Dee Murray played on with Spencer Davis called Funky is now (May 2004) available on CD (try Amazon in the UK). The first time I saw Dee with Spencer Davis was at college at RISD in Providence, R.I. in 1969 and he was playing with Nigel Olsson and Ray Fenwick. Needless to say it was a great concert, and I saw him with the same group in L.A. that summer. Later, in 1970 I believe, he started touring with Elton John and Nigel and again, it was quite a treat to see them. The album Funky is a close replication of the way they sounded with Spencer Davis back then, and for those who might have seen that group, you'll really enjoy this CD. The album doesn't do them justice. Ray is incredible live, as were Dee and Nigel, but this album is the only record we have of that group.